Have you ever been to a concert in the middle of the night? No, neither had I until this weekend, when the Seattle Symphony christened its new Octave 9 performance space, in the Second and Union corner of Benaroya Hall, with a 24-hour marathon concert of contemporary chamber music, 5 p.m. Saturday to 5 p.m. Sunday. I dropped in to hear a couple hours of the performance (billed as "Dreams") slated to fill the overnight period, quiet ambient electronic music by Marcin Pączkowski, a composer and digital artist from UW’s Center for Digital Arts and Experimental Media (DXARTS). The space, designed by LMN Architects, is both simple and startlingly unique among Seattle concert venues: a carpeted circle surrounded by 300 degrees of floor-to-ceiling blank white screen. 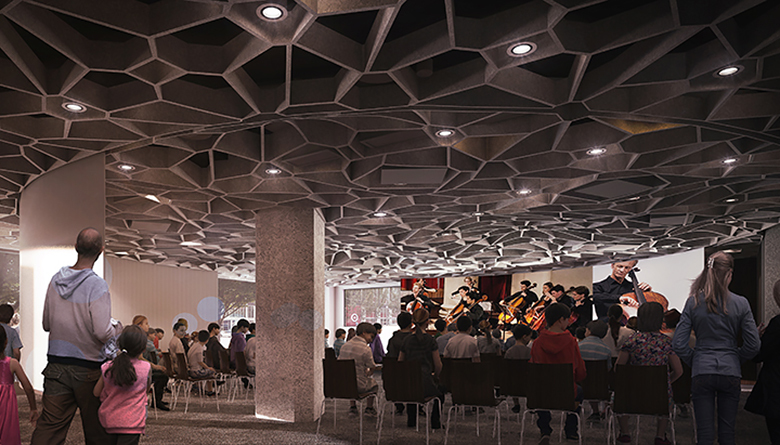 The ceiling is designed like a honeycomb—or more accurately, like Honey Comb: a pattern of nooks and crannies, like the breakfast cereal writ large, which both diffuse the sound and hide the projectors, speakers and other multimedia paraphernalia. Within the circle, plain black chairs can be set up in any configuration—or omitted as they were Saturday night, with pillows and blankets provided for those who wanted to sprawl on the floor for Pączkowski’s five-hour sonic environment. About 18 people were settled in when his performance began at about 1:30 a.m. Comfort is vital for this sort of music sound-bath—no point in sitting upright facing forward in rows, as you would in a traditional concert hall, as the sound is happening all around you—and the flexible Octave 9 is a fine space for it. (Though I wouldn’t mind hearing a Haydn string quartet under similarly informal conditions, either.) I can’t tell who’s sleeping; there is no snoring, at any rate. By 2 a.m. the organ drone has morphed into a stringier sustained sound, like a constantly bowed hurdy-gurdy. Pączkowski adds other sounds atop it—vaguely symphonic, they’re possibly manipulated samples from orchestral recordings. The twinkling white cursors round off their corners and develop tails… and suddenly the starry night becomes a galaxy of, well, sperm. Pączkowski’s performance is slated to last until around 6, when other performers will arrive and John Luther Adams’songbirdsongs will greet the dawn. The bus schedule demanded that I leave at about 3, though, so I tiptoed out, leaving Pączkowski busy at his laptop and the remaining dozers happily chilling.